Installing it now, hope it goes well. This was a surprise. Good luck luck ! min Mine hav had no problems. Im going to do factory reset now. I got this wifi calling icon in the quick shade and in my app drawer but it doesn't do anything. Anybody else notice this? How do you turn off power saver notification in Lollipop? KitKat method turns the feature off in Lollipop. Downloading now. Keeping my fingers crossed. I'm using the M7 on Sprint. *** so, almost an hour later and it's upgrading my apps. Make sure you have time before starting this process. I have tried downloading this update 3 times. After the download finally finishes, it tells me that the file is corrupt and do I want to download again. Received it in the early morning hours of the 5th. When will the Samsung Galaxy Tab Pro 8.4 get the Lollipop Update? 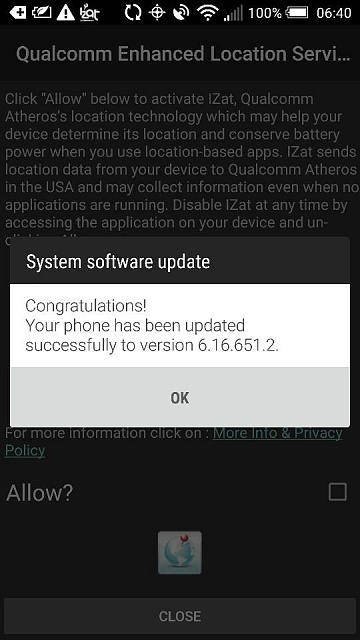 is the Verizon S5's Android 5.0 Lollipop update really more than 1600MB?